The new Nexus 7 is pretty awesome in all respects, and it should be right at the top of your list if you're looking for a 7-inch tablet. But if your budget won't stretch up to $230, ASUS has a more low-end model that's perfectly respectable. The Memo Pad HD7 (ME173X) is an upgrade to last year's budget tablet, and it's up for pre-order at no less than four, count 'em, four US online stores. The retail price is $149.99. The HD7 features a 1.2Ghz quad-core MediaTek processor, 1GB of RAM, 16GB of storage plus a MicroSD card reader, a 5MP rear camera and a 1.2MP front-facing cam, and the standard 1280x800 resolution. Best of all, it runs Android 4.2 (which is by no means a given on budget hardware) plus some customized ASUS additions. It's definitely not the fastest gun in the west, but if all you want to do is read, surf, and maybe play some light games, it should suit your needs. Which vendor you buy from will depend on how fast you want your tablet, and in which color. Gamestop says that the Memo Pad HD7 launches on August 9th in blue, white, and pink colors. Newegg's stock is going on sale the next day, with a bonus green color. Amazon has all four colors available at a slightly lower price of $149, but won't ship till August 11th (Amazon Prime 2-day shipping applies), while TigerDirect offers all four as well, but doesn't say when the tablet goes on sale. If you're looking for a good deal with similar specs (and don't mind giving up the rear camera and MicroSD card slot), you might try hunting for a 2012 Nexus 7 instead. 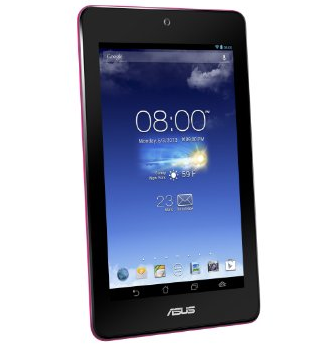 The used market for these tablets is flooded after the release of the new model, and some retailers probably have discounted stock available as well. If you're on the fence, Android Police will have a full review of the Memo Pad HD7 coming soon.